Do you read The Very Hungry Caterpillar by Eric Carle? It's one of my all time favorite spring stories. 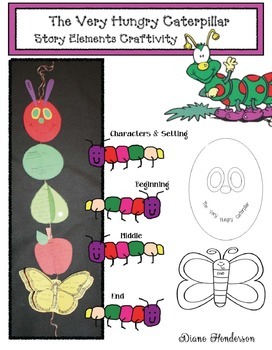 With that in mind, I designed this Very Hungry Caterpillar inspired "dangler", which is a super-fun way to practice story elements, and assess comprehension. I’ve included patterns for the antennae and facial features if you like the “cut & glue” look of the caterpillar. Students can also draw their own facial features, or print off the head pattern that’s filled in, so children can simply color it. The “smile” of the caterpillar says the title of the story. There are also patterns for the leaf and stem of the apple. I chose red for the head, to look more like Eric Carle’s caterpillar, but you could run off the pattern on a variety of different colors. Add extra 3D pop & pizzazz by giving students two leaves and two butterflies. They fold the leaf in half and glue to one side. I also gave my kiddos a tiny white pom pom that they attached to the leaf with a glue dot, to represent an egg. This way I could also review the life cycle of a butterfly. The 3D butterfly is made by folding the wings up on either side of the thorax, then gluing just the top thorax onto the bottom one. There are two butterfly options. Grab that teachable moment to explain what a thorax is, and build vocabulary. The 3D options take just a few minutes and really add the “Wow! factor". I’ve also included an optional circle that you can end the caterpillar’s “body” with. It’s labeled with problem & solution. Completed projects look awesome dangling from the ceiling, or hung as a border along the top of a hallway wall. I'm Diane from Teach With Me, wishing you a wonderful spring.